This evening of Resolution! begins with an exposition of Kathak by Drishti Dance, a trio of choreographer Anuradha Chaturvedi and dancers Meena Anand and Shyam Patel. 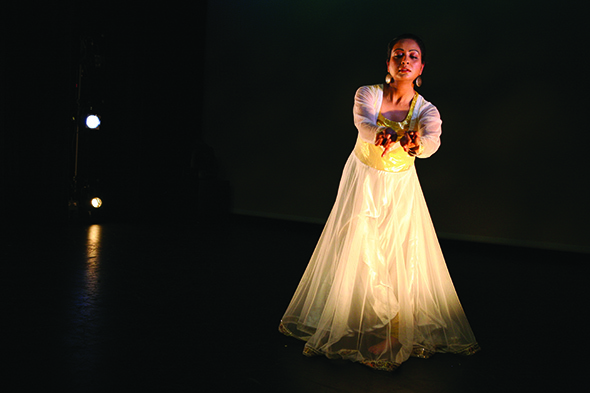 Antaraal is a work that weaves choreography with music and verse in which all three elements span two cultures: Chaturvedi is based in Reading but brings her knowledge and mastery of Kathak from Lucknow in India; the score is shared between Oxford-based Malcolm Atkins and Lucknow-based Ustad Gulshan Bharati, while the verse is from Mohan Rana, a Hindi poet living in Bath. Antaraal is thus a meditation on the diaspora life, rooted in tradition while adapting to a new cultural context, a place where ‘movement is caught between two worlds, one dead and the other yet to be born.’ To my Western eye, however, the elements of gesture, rhythm and costume in Antaraal speak of an unequivocal, and very much living, Indian experience, so it is difficult to know what is ‘dead’ and what is ‘yet to be born.’ Perhaps in placing Kathak in the service of both Eastern and Western musical rhythms Chaturvedi is suggesting a journey between the two, somewhere between departure and arrival. But what my memory retains are the floating, sinuous gestures of the three dancers, their poise, the clarity of their facial expressions and the rhythmical hand and footwork responding both intimately and animatedly to the music. and the endless days that were following us, too have stopped. in a conversation that catches an unfinished past. Dressed in layers of black against a black backdrop on a black floor seems a paradoxical way of establishing the art of exposure but Bridget Lappin relishes the challenge, bringing her bright gaze to the darkness around her in The Art of Exposure. There is no credit for lighting but the timeless beginning — a very gradual sensitizing of our eyes to Lappin’s still, shadowy, spectral form — and her mysterious disappearance at the end are beautifully staged. Camouflage is central to the work, and Lappin refers in her program note to a 17th-century Ninja manual on the art of concealment, Shoninki, but she spends the entire performance shedding her camouflage just enough to establish it, teasing us with her ability to materialize out of the dark and leave an indelible image. She does this by taking on the disguise of first a ninja, then, by replacing her warrior mask with a touch of lipstick, a woman and finally (as in Young Galaxy’s track) ‘just a body’ — what she describes as ‘deceptions in an act of self-preservation against her environment.’ Her movements are at once assured and mysteriously quiet, clear and off-balance, her gestures fast and complex. In the half-light the outlines of her body are erased so all we see of her is bare hands and face, or, in the final stage, her bare back inside the v-shaped opening of her unitard. It is the art of exposure by stealth and suggestion and it is remarkably persuasive. The final work, Laura Obiols’ Hourglass, is ‘a journey with Lilly to explore growing up in a society full of expectations and fear of taking risks, where time seems to be chasing you.’ Obiols pulls together elements of biography like a magician conjuring rabbits out of a hat: the talking shoes and boots setting up the family story at the beginning (set design by Michelle Bristow), Lilly’s transformation from young girl to a young woman and the appearance of characters one after the other from behind a sofa. We first see Lilly in the person of Betty Toogood Sayers sitting long-legged on the floor writing in a diary while her father, James Finnemore, is (so we learn from the voiceover) going through a bad phase. Lilly is unaware of his anxt-ridden, gravity-laden solo and runs to be picked up on his shoulders. By sleight of hand she grows into Léa Tirabasso but then things start to get fuzzy. Michael James Gilbert is someone she picks up (or he picks her up) at a club but it is not clear for whom he is performing. Rosie Terry makes an appearance as a friend and then Kieran Page dressed like Terry replaces her from behind the sofa to offer Lilly his hand. The three men in Lilly’s life bear an uncanny resemblance to each other, which is confusing; they are distinguished more by their respective dance genres than by their characters. Only Tirabasso remains her growing or shrinking self, and there is a tantalizing moment after the four adult characters manipulate her like a spinning compass when I thought for sure she would dance a trembling apotheosis but she is interrupted and never gets to express herself in maturity. It is an analogy for Hourglass itself; with the exception of the two underused musicians — Nuria Sobrino on piano and Charlie Stock on viola — the talents of her cast and the input of her production team appear to have turned Obiols in different directions: beside some lovely symbolism and imagination there are elements of over-literal storytelling and patchwork dance: building blocks but not yet architecture.